Little pleasant cottage in an beautiful location. 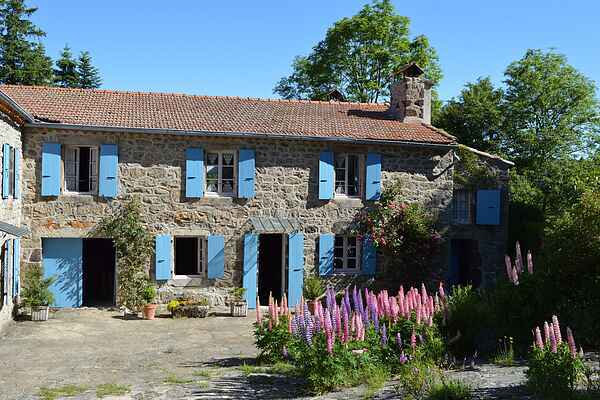 Located at the edge of Mas Vendran hamlet, situated at almost the highest point (c. 1,000 m) At c. 250 m from your house you will find a reference point. From here you will have a 360 degree view of your surroundings. You will even be able to see Lake Naussac quite clearly! You will be on the second floor of the right wing of the L-shaped building. The surrounding area (c. 1 ha), including vegetable garden and extensions, will be shared with a friendly old lady living in the left wing. Here you will have a very spacious terrace and garden furniture, parasol, BBQ and a magnificent view. There is also a long veranda which heavenly in pre and late season. Mas Vendran is the name of the little hamlet the house is in. It's part of Lanarce which is 8 km further, but still in the Ardèche at the border with Auvergne and the Languedoc-Roussillon. You will go on the most beautiful hikes straight from the house. For places of cultural interest we will send you to the Roman cathedral of Le Puy-en-Velay (45 km). In Mende (58 km) you can visit the Notre Dame Bridge.